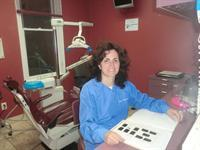 Services Victoria Pedoeem, Doctor is a dentist/dental office located in Jersey City, NJ. A dentist is trained to diagnose, treat, and prevent diseases of the gums, teeth, and jaw. Please call Victoria Pedoeem, Doctor at (201) 217-9670 to schedule an appointment in Jersey City, NJ or get more information. I don't think I have ever been put on hold here for a long time and am so impressed with how quickly all of my questions are answered. There's nothing worse than having to wait on hold for a half an hour just to get someone to talk to you. I really admire them for being more than willing to ask for help from other professionals in the field when they don't have an answer to my question. They aren't even slightly arrogant, and I'm confident they always have my best interest at heart. I loved how gentle and careful they were while they were flossing my teeth. My gums didn't bleed at all. I was amazed at how wonderfully they treated each of their staff members. They were so appreciative and thankful. I've never seen any employer treat their staff better, and it made me want to come back that much more. Every time I come here they always remember me by name and greet me as soon as I walk in the door, even if it's been months since my last appointment. They are so thoughtful and amazingly sweet, I just love this place.